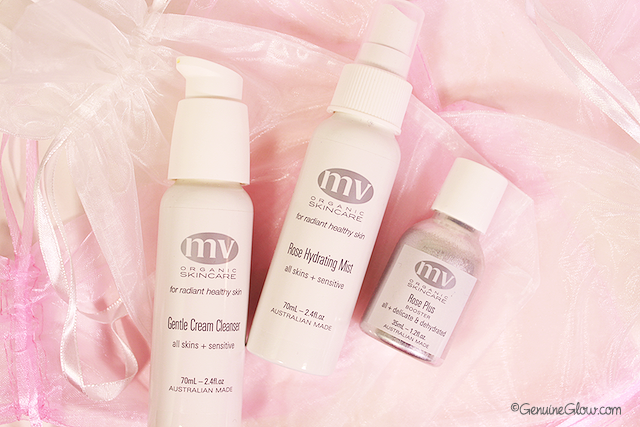 I have already mentioned plenty of times how much I love MV Skincare’s products. To be more precise, it is my skin that loves them and looks great when I use them. I have tried a few products from the line, and unfortunately for my wallet, they worked so well for me. I thought that I would share my thoughts about the three products that I have been using lately. Gentle Cream Cleanser*. This cleanser is nothing short of amazing. The consistency is concentrated, so I only need a small amount of product to cleanse my whole face. I like to apply it on wet skin so that a small amount goes a long way. At the touch the texture seems to be very rich, but when massaged on wet face it feels light and soothing. The scent is delightful, slightly flowery, but very delicate. After cleansing with this cream my skin feels well-cleansed, but also moisturized and balanced. I am convinced that this cleanser will work equally great for any skin type, because it is hydrating enough for drier complexions, but it is also non-greasy and does not leave any shine on my (combination) skin. It is so gentle, yet so effective. Although it removes makeup well and it does not sting my eyes, I prefer to use it as a morning cleanser or as a second cleanser in the evening. Whenever I am wearing more makeup than usual and/or sunscreen I find a cleansing oil to be a quicker option, so I do a second cleanse with the Gentle Cream Cleanser. However, if you do not wear much makeup you could definitely use this cleanser as your only cleanser. My bottle lasted me about two months and a half, and I used it almost every morning and evening. Lastly, as a product junkie I have to praise MV Skincare for such great packaging. This bottle comes with a pump system (my favorite, to be honest) and includes a simple, clever tool to scoop out the last drops of product from the bottom of the bottle. I am sure that you will appreciate that as much as I do! Rose Water Mist*. You guys know how much I love face mists, (I have a few Tuesday Toners posts already up and will review more in the future). They are an essential part of my skincare routine because: 1- they give moisture back to my skin following the cleansing step, 2- they calm my skin after using tap water for cleansing, which I find to be slightly irritating, and 3- they prepare my skin for a serum or face oil in the evening, and a water-based moisturizer the next morning. Please note that there are some inexpensive rose waters available at the drugstore/health food store, but you should not mistake MV Skincare’s high-quality rose water for “the same exact product with a higher price tag”. The quality of the ingredients is a determining factor in the price of a mist and so is the percentage of rose oil versus the water content. This Rose Water Mist smells like pure, fresh roses. In addition to that, most inexpensive rose waters come in plastic bottles, while higher quality mists come in glass or metal. Rose Plus Skin Booster*. In line with the first Skin Booster that I tested, called Instant Revival, this is a revitalizing serum that nourishes the skin and is particularly suited for delicate and problematic skin. I love to use it at night to provide my skin with a richer treatment and it translates into a greasy-free glow the following morning. It works beautifully when combined with the previous two products that I listed. I use the Gentle Cream Cleanser, spritz my face with the Rose Water Mist, and then apply two drops of the Rose Plus Skin Booster (while my skin is still damp) all over my face, around my eyes, and on my neck. It is such a gorgeous, powerful trio and totally worth the splurge. 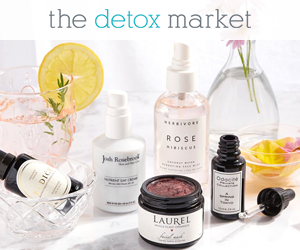 A few places where you can shop the line are The Detox Market (USA), Cult Beauty (UK) and MV Skincare (Australia).